As a holistic health practitioner certified in both complementary and integrative health and Clinical Herbalism, Rachelle Robinett knows how sleep can impact everything from productivity to neuroprotection. While she knows the plant for just about any ailment (she’s the founder of herbal cafe Supernatural, after all), she’s the first to confirm that how we sleep at night depends on how we spend our day. Syncing circadian rhythms won’t take long with the right routine—and she has a few notes to get us started. If the goal is to feel tired when it’s time to fall asleep, we need to activate the parasympathetic nervous system—aka our “rest and digest” state—and minimize the “fight or flight” of the daily grind. The proof is in biology: we respond to daylight and nightlight at a cellular level. Natural light (or absence of it) triggers the release of hormones that dictate how alert we are. The hormone cortisol is like our body’s morning cup of coffee, and a tuned-in body will release it in the morning to help wake us up. Melatonin is like our evening chill pill, which we get a shot of when our body senses that the sun is setting and the day is winding down. One study found that just a few more hours of light could shift a body clock by six hours in one week, making it essential to be sensitive to nature’s rhythms. The newest addition to our team of CAP Beauty healers, Rachelle is a Holistic Health Practitioner, Clinical Herbalist and Founder of Supernatural, the gorgeous high health cafe inside of Woom Center. Rachelle combines natural medicine with practical habit-building to help people find balanced, lasting vitality. A student of Shamanism as well, Rachelle has studied the relationship between plants and people and guides us to seek health through a deep connection to nature, the Source of life. The plant kingdom is ripe with medicine. Embrace its healing, embrace its life force and let Rachelle be your leader. These days, it can feel like everything comes with a side of adaptogens. From superfood chocolate to functional elixirs and beyond, herb-based medicines are easier to come by than ever. 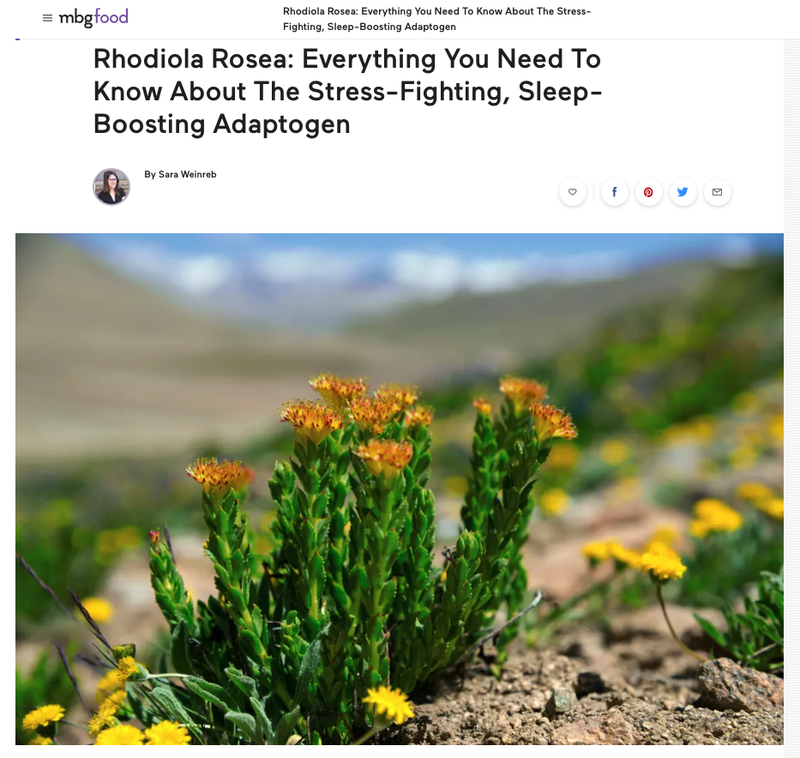 And one adaptogen you're likely to see more of is Rhodiola rosea, a flowering plant whose root can be used for fighting stress and anxiety, increasing athletic performance, boosting energy, and more. Also known as golden root, arctic root, and King's crown, it has been used for centuries in traditional Chinese and Greek medicine—and its beginnings may stem back as early as the first century A.D.
As someone who has spent the past year and a half moving away from pharmaceuticals as much as possible (while understanding, appreciating, and utilizing them when needed!) and gravitating toward plant -and food-based medicine, I love exploring the uses and benefits of adaptogens and herbs. And Rhodiola rosea is a powerhouse that I keep in my herbal arsenal. So, what are the benefits of taking Rhodiola rosea? First and foremost, Rhodiola rosea is an adaptogen, so by definition it helps your body adapt to stress. These super herbs can adapt to what your body needs—whether it be a boost of energy when you're fatigued or a way to calm anxiety in stressful situations—and help regulate your cortisol levels to stave off fatigue. "Adaptogens are one of my favorite natural healing tools to use in my functional medicine clinic. I often recommend Rhodiola for patients who are severely stressed and anyone struggling with adrenal fatigue as it works to support your sympathetic nervous system—the stress control center of your body," shares Will Cole D.C., IFMCP, an author and functional medicine practitioner. It increases energy and fights fatigue. One of the foremost reasons individuals choose to take Rhodiola rosea is for its energy-boosting and fatigue-fighting properties. According to one study that followed nursing students working shifts, Rhodiola rosea helped reduce their fatigue levels more than a placebo. Rhodiola rosea has also been shown to be beneficial for brain function and concentration. Another clinical trial showed that participants who took Rhodiola rosea every morning were more capable of fighting burnout and maintaining concentration throughout the day. It can boost physical activity. Due to its energy-boosting abilities, Rhodiola rosea is often used by endurance athletes. One clinical study that followed young, healthy individuals who took Rhodiola rosea daily for four weeks showed an increased endurance during exercise, and the adaptogen has even been shown to act as an antiviral during prolonged physical activitysuch as marathon running, meaning it makes athletes less susceptible to infection. It's not just for super-athletes either. "Rhodiola can be really effective for people who are consistently physically active. Athletes, yes, but also any of us who stand for much of the day, walk a ton, lift, or the like," explained Rachelle Robinett, a holistic health practitioner and founder of Supernatural. "As an adaptogen, it's been pretty well-studied in physical (and mental) performance, and if it's the right herb for you, you should see better performance times or cognitive function, and recovery from physical exertion too." So before you hit the gym, go for a run, or hike up that mountain, consider a dose of Rhodiola rosea for some extra support. It might help fight depression. The adaptogen has also been studied in regards to supporting individuals struggling with depression. Compared to Sertraline, a pharmaceutical antidepressant (you may know it under the name Zoloft), Rhodiola rosea was found to be less effective at treating symptoms, but it had fewer side effects like nausea and drowsiness. The study concluded it to be a potentially better option for those with mild to moderate depression who want to mitigate the risk of such side effects. The laundry list of other potential Rhodiola rosea benefits in early research stages includes fighting diabetes, fighting cancer, preventing altitude sickness, and more. That sounds awesome! I should definitely take it then, right? Adaptogens are widely considered to be safe and low-risk, but there are certainly some things to keep in mind before taking them on the daily. Rhodiola rosea side effects are rather limited, but a small group of participants in one study showed mild side effects such as headaches and insomnia. "Rhodiola can be over-energizing, but in lower doses this can turn into a calming effect," explained Robinett. So you should consider taking Rhodiola in the morning, but be cautious if you are already a hyper-energized or anxious person. Rhodiola rosea side effects have also included dry mouth and dizziness. If you feel these effects or any general discomfort after taking Rhodiola rosea, stop taking it. There may be an herb that provides similar benefits that your body is more welcoming to. You should avoid experimenting with Rhodiola rosea if you are pregnant, breastfeeding, or taking mood stabilizers. It is always optimal to consult with a doctor, herbalist, or naturopath when considering which herbs and adaptogens are right for you. OK, I want to try it! How much do I take and in what form? It's important to note that adaptogens generally work in your body over time, so try to work them into your daily routine for optimal benefits. If you want, you can take the occasional break to see if the herbs are really working. Rhodiola rosea comes in several forms—powder, tincture, extract, and pills. "I love the powder, because I get to smell it, taste it, and see the dusty-pink color. But for convenience, tinctures are also great," Robinett explains. Personally, I take it in tincture form, which I throw in water or into a morning elixir. As for dosage, smart small and work your way up. Robinett advises "One-eighth teaspoon per day to start, if using a powder standardized at ~3 percent salidosides, for example, which is then increased slowly to find the sweet spot. For most, if it's the right herb for you, that tends to be between 100 and 400 milligrams per day. If you're not seeing benefits there, it may be worth exploring other options." If you have a local herb shop, the herbalists may be able to provide specific dosing for your needs or make you a blend with other herbs that would be relevant to what symptoms you are experiencing. You also want to make sure Rhodiola rosea (and any other herbal supplements you're taking!) come from a trusted source. Look for third-party certifications from the brands you are purchasing such as the USP or NSF seal to make sure you're taking the adaptogen in its pure form. This post appears originally on mindbodygreen, here.